Techniques: Session Notes, Mix Rescue, Extracting Vocals From A Stereo Mix. Features: Inside Track: Lukas Graham, Studio SOS, Ernst Zacharias & The Hohner Clavinet. There have been numerous recreations of the Minimoog in recent years, and the latest manufacturers to take a stab at this are UK newcomers, AJH Synth. 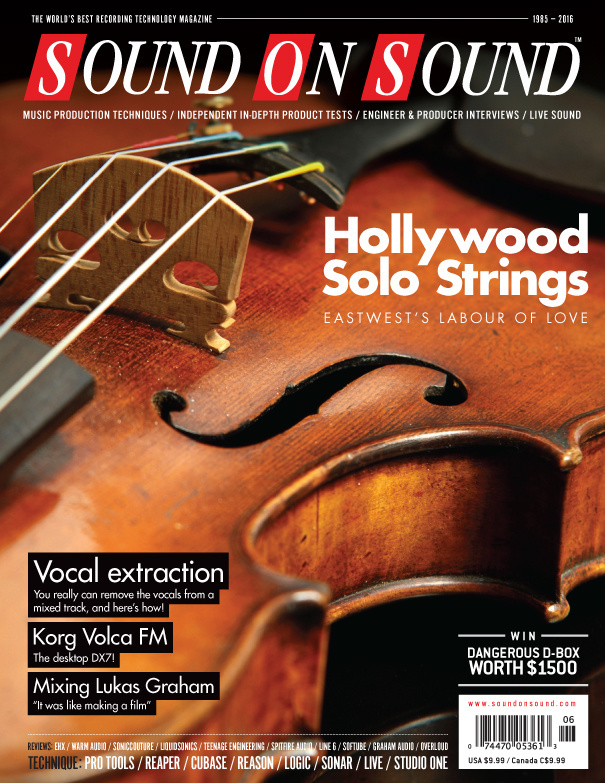 Hollywood Solo Instruments puts world-class violin, cello and harp sounds at your fingertips. Electro-Harmonix have reintroduced two of their classic ’70s drum synths. The BBC’s legendary LS3/5A is arguably the Godfather of nearfield monitors — and now it’s back, thanks to UK company Graham Audio. Many well-known engineers are now lending their names to plug-ins, and now metalcore specialist Joey Sturgis has joined the fray. After five years of manufacturing microphones, Lewitt have developed a recording app for iOS devices. Eighteen years after the launch of their ground-breaking POD, Line 6’s new flagship amp-modeller looks brimful of promise. Algorithmic reverb plug-ins still can’t match high-end hardware, but Liquidsonics are bridging the gap with an innovative new convolution technique. With such brilliant software reverbs now available, does this new hardware unit warrant a place in the space race? With new amps, effects and a stripped-back GUI, is Overloud’s modelling software ready to play a headline slot? With its built-in Overloud guitar and bass processing, could this iPad-controlled mixer do away with the need for backline altogether? How would you like a Seaboard with a built-in sound engine for free that fits in your pocket? As well as modelling Drawmer’s versatile multiband mastering processor, Softube have boiled down its essentials to create an easy-to-use preset version. Spitfire build on the Albion legacy with a new orchestral library. Known for their idiosyncratic approach, Teenage Engineering’s latest product is pocket friendly in every sense. Falcon features a DAW-style mixer with up to 17 pairs of outputs, and supports UVI sound libraries (of which there are many), so one of its functions is to act as a sample library player. Legacy is inspired by Blade Runner and other classic 80s sci-fi movies. That world of sound is what Legacy attempts to capture, distil, and then present in a sample library format. Learn to make the most of Cubase 8.5’s Retrologue 2 synth. Truly an international effort, Lukas Graham’s breakthrough hit ‘7 Years’ was masterminded by a Danish film-sound designer and a Californian mix engineer. A directory of all media pages that hold the associated media files for June 2016 audio examples. Sonar’s new LP EQ lets you perform Mid-Sides EQ’ing with ease. This month’s band, the Broken Heartbreakers, threw down the gauntlet for our engineer — could he improve what was already a decent mix? Audio examples to check out yourself. Pro Tools 12.5 lets you collaborate remotely with other users. Here’s how to get started. We show you how to create your own ReFills and REX files in Reason. Must modern metal drums rely on triggered samples? Our engineer shows how you can mic up a kit for a modern, heavy sound. How to recreate open-reel tape trickery in Reaper. This month tracks from: D'Angelo, Zara Larsson, Lukas Graham, Mavis Staples and John Williams' Star Wars theme. Understanding the way track grouping works will help keep your Studio One projects under control. Program drums and automate effects faster with Logic’s Step Editor. The sound designer’s role in a big-budget musical is to create an immersive experience for the audience — and keep the cast and director happy too! Sounding Off: TB or not TB? That really is the question. Is it time that we retired our TRs and TBs and forced ourselves out of our comfort zones? Read more about Sounding Off: TB or not TB? That really is the question. Q. Does it matter which ‘version’ of a reference track I use? Read more about Q. Does it matter which ‘version’ of a reference track I use? Every TV producer knows the value of a good ‘ssssccHHH PRRRgghhh’. How are you going to give them what they want? Media content for the June 2016 issue.